As Pence Tours Mideast, Tension Lingers Over Trump's Jerusalem Decision : The Two-Way The topic came up during Pence's talks with Egypt's and Jordan's leaders. The vice president now heads for a warmer welcome in Israel from the country's government. 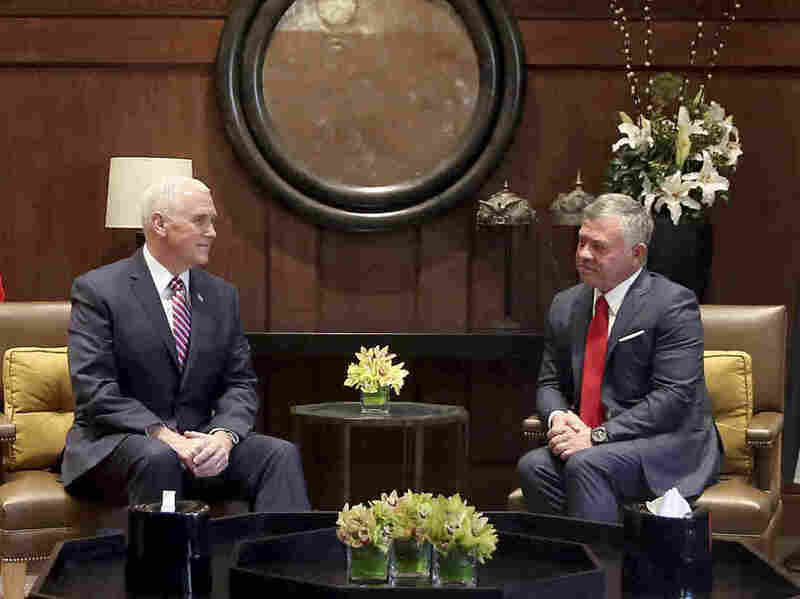 U.S. Vice President Mike Pence, (Left), meets with King Abdullah II at the Husseiniya Palace in Amman, Jordan on Sunday. Pence's trip — originally planned for December before being delayed to allow the vice president to stay in Washington, D.C. to vote on the GOP tax bill — comes as the U.S. government remains shut down. Pence addressed the government closure on Sunday, placing the blame with Democrats and saying that negotiations over immigration would not resume until the government was up and running again. Meeting Sunday at the Royal Palace, the official working office of Jordan's King Abdullah, Pence called President Trump's decision last month to recognize Jerusalem as the capital of Israel and take steps to relocate the U.S. embassy to the holy city "historic" and said it should not negatively impact peace talks between Israelis and Palestinians. The vice president had lobbied within the White House for the move, which was divisive on the world stage but a long-held aspiration for evangelical Christians such as Pence. Jordan's King Abdullah appeared to disagree with Pence's reassurance, referring to "rising frustrations" in the region. Abdullah said Jerusalem remains as important "to Muslims and Christians as it is to Jews," adding that he believed Jerusalem's status should be determined not unilaterally by the U.S. but as part of a "comprehensive" settlement of the conflict between Palestinians and Israelis. The king also reminded Pence that he had expressed concerns to the U.S. "over the past year" about changing the status of Jerusalem. Fielding questions later Sunday about his meeting with Abdullah, Pence downplayed any tension, saying, "look, friends occasionally have disagreements." Many Palestinians see East Jerusalem as their future capital in a so-called two state solution. As NPR's Jane Arraf reported for our newscast, Jordan's alliance with the U.S. is complicated by the change. Although a majority of Jordanians are originally Palestinian and view their country as the custodian of important Muslim sites in Jerusalem, the country also receives more than $1 billion annually in military aid from the U.S.
Pence's talks a day earlier in Cairo with Egypt's President Abdel-Fattah el-Sissi avoided any public discordance over the Jerusalem issue. Together Pence and Sissi vowed to represent a united force against terrorism and the influence of ISIS. Pence later acknowledged to reporters though that the Jerusalem issue did arise in private and that he had listened to Sissi's concerns. He stressed to Sissi the United State's commitment to peace negotiations and support for a two state solution "if the parties agree." The vice president also told reporters he had privately pressed Sissi — whose military led a coup against Egypt's previously elected president and whose government has been accused of repressive actions — on human rights issues, notably his government's continued imprisonment of American citizens on what many view as dubious charges. After departing Jordan on Sunday, Pence stopped briefly at a U.S. military base near the Syrian border to address American troops tasked with battling ISIS. "We are driving the evil of ISIS from the earth," he told the service members in attendance. Pence also took the opportunity to speak to the ongoing shutdown of the U.S. government. "We're going to get this fixed," he told troops. "We're going to meet our obligations to you and your families. And we're going to make the strongest fighting force in the history of the world stronger still." Pence also told the military in attendance that immigration talks would be put on hold until the shutdown ended. "In fact, we're not going to reopen negotiations on illegal immigration until they reopen the government and give you, our soldiers and your families, the benefits and wages you've earned." Before flying to the Middle East, Pence had said in a statement that "rather than solve problems, Democratic leadership preferred a shutdown that has dangerous consequences for our national defense." He added that during the shutdown, the military would continue to "stand their post without pay." Pence's next and final stop on his trip is Jerusalem, where he will spend two days in talks with Israel's Prime Minister Benjamin Netanyahu, who last month said he "will be forever grateful" to President Trump for his decision regarding Israel's capital. Pence will also meet with Israeli President Reuven Rivlin and delver a speech before the Knesset. Pence is not slated to meet with any Palestinian leaders during his time in Israel. Amid his visit with troops Sunday, Pence said he hopes "the Palestinian Authority will soon reengage." NPR's Tamara Keith reports that people familiar with the weekend's meetings say the vice president pressed both Egypt's president and Jordan's king to urge the Palestinian Authority to meet with Pence or at least return to the negotiating table. In Egypt, Pence says he was able to communicate another priority to Sissi: his concerns over the persecution of religious minorities in the region. As NPR's Keith reported last month, Pence told the In Defense of Christians Solidarity Dinner in Washington, D.C. last October that the issue was integral to his planned travels. "President Trump has directed me to go to the Middle East," Pence said in his speech. "And I promise you one of the messages that I will bring on the president's behalf to leaders across the region is that now is the time to bring an end to the persecution of Christians and all religious minorities." However, the pope of the Coptic Christian Church in Egypt declined to meet with Pence during his stop in the country, citing President Trump's decision to recognize Jerusalem as the capital of Israel. During his stop in Egypt, Pence also spoke in defense of another group: the press pool accompanying him. A senior aide to the vice president tells NPR's Keith that after the pack of reporters traveling with Pence were held back by Egyptian officials, Pence personally requested that Sissi allow the American press to enter, to which he consented.